That’s the system that we are in. It is an adversarial system. No surprises that Pyne would make comments like this, endorsing conflict based governance and trivialise an important ceremonial practice whilst completely missing the message Australians are sending both parties. The message is we are tired of adolescent style bickering and one up manship, name calling and the political machinations of men and women who seem to have arrested development at the school yard level where adversarial gangs form and bullies threaten all manner of ill fortune if people do not succumb to their rule. Christopher obviously has no clue about what he refers to as the ‘peace pipe’. It is a highly regarded Ceremonial process that seeks to unite people for the betterment of all rather than divide for ‘ferocious’ debate and machinations. Entering into the Pipe Ceremony requires maturity, wisdom, clear vision and a commitment to moving through conflict and differences with integrity and selflessness. There is no place for ego, self invested interests or political undercurrents in the Pipe Ceremony process. It is an ancient practice that has a great deal to teach people about co-operation, humility and harmony as intrinsic to leadership and bringing about change. The renewed outrage of the Liberals over their loss has ignited their collective wrath and they have emerged with fighting words that are filling the air waves now that Tony Abbott has retired his nice-guy, co-operative strategy. This kind of behavior would not be tolerated in a Pipe Ceremony. The Liberal party has missed the opportunity to find the gift in the message and the opportunity for wisdom and insight and will remain stuck in the rapidly outdated era of ‘us and them’ adversarial politics whilst the country moves onto our next level of collective maturity and growth. It’s time for politicians to grow up stop the name calling, the relentless game of nyah-nyah and “I told you so” and listen to what these election results are telling them and why the Greens are rising. It’s about people over profits, maturity over bickering and a new level of negotiation in business which, by the way, is how business was done in this country by its wise custodians for thousands of years prior to the adversarial, divisive systems that arrived in 1788. These are still the core of customary governance in Communities that have survived the invasion onto traditional land and culture with traditional Law in tact…. Contrary to Pyne’s dismissive remark that the ‘peace pipe’ is an object of ridicule, at best a bit woo-woo and at worst ridiculous, there is a high degree of knowledge, co-operation, mutual respect and spirituality involved in the Pipe Ceremony process. The protocols and practices are centered on values that are often absent in western politics with its aggressive dynamics, oppositional dialogue and mean spirited negotiations. Divisions, bickering and fighting across the floor will never produce the same results as when people meet in a ceremonial circle where all people and views are respectfully heard. Those of us who have been privileged to participate in the formal Pipe Ceremony recognise the immaturity and ignorance of Christopher Pyne’s ‘peace pipe’ assertions and the limitations of his cultural knowledge based on a highly Euro-centric world view. His words are an insult to the Elders who facilitate the Pipe Ceremonies as custodians of the ancient history and living practices of the Ceremonial Pipe. 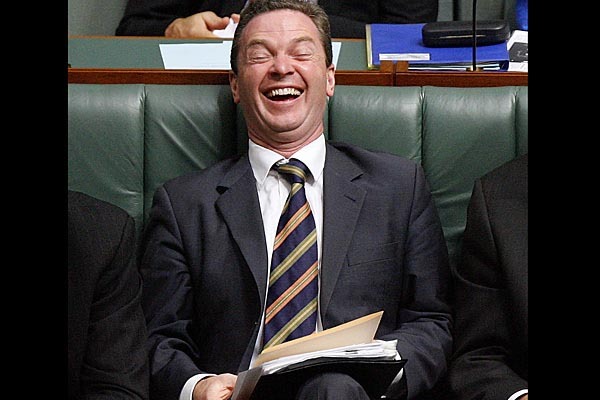 Photo of Christopher Pyne from The Age newspaper..